For the majority of users, installation is simply a matter of downloading the msi files (Windows) or .macrhi (Mac) and double clicking them. Then running the license request command in Rhino or button on dialog. Sometimes you may need to manually replicate some of the steps of the installer (particularly if you don’t have admin permissions). If you have problems, please email me, there is also a discussion forum here. Rhino v5. It is strongly recommended Grasshopper is also installed. Download latest installers (.msi files) from http://www.geometrygym.com/downloads I always recommend installing BullAnt (formerly known as StructDrawRhino), and always update to latest installer of all plugins of interest (to ensure compatibility). Plugins are updated on a frequent basis with small improvements and it’s a good idea to update (when available) every month or so. An automated update might be possible in the near future. Make sure the rhino application is not running, and run each of the installers by double clicking (windows security might take a few seconds prior to permitting installation). The installer will attempt to create registry keys (windows) to instruct Rhino to load these plugins when starting. If you installed for the first time, Rhino should report loading of new plugins. When started, new rhino commands starting with gg such as ggGeodesicDome should be available. If not and using Windows, the typical plugin installed location is C:\Program Files (x86)\Geometry Gym\Rhino3d Browse to this folder and drag and drop the .rhp files over the Rhino application window (or load from rhino plugin manager). I do charge for my developments for commercial work (license fees enable me to work full time on these developments). If you run the rhino command ggZZLicenseRequest command, a dialog will present. If you a variant of Outlook/Windows Live installed, you can accept the option for an email to be prepared to send to me. If not, the xml text data I need will have already been placed in Windows Clipboard. Paste (Menu – Edit- Paste or <CTRL> – v) into an email to me. If you haven’t gotten a reply within a day, please check email was sent or chase me up with another email. I respond to license requests as quickly as possible. If I’m online it will be near immediate, worst case should be 10 or 24 hours. If you don’t get a reply, please email me again. In Grasshoppper, if you have a compatible version installed there should be new menu(s) of components titled GeomGym (and GeomGymBIM if you installed a BIM plugin). 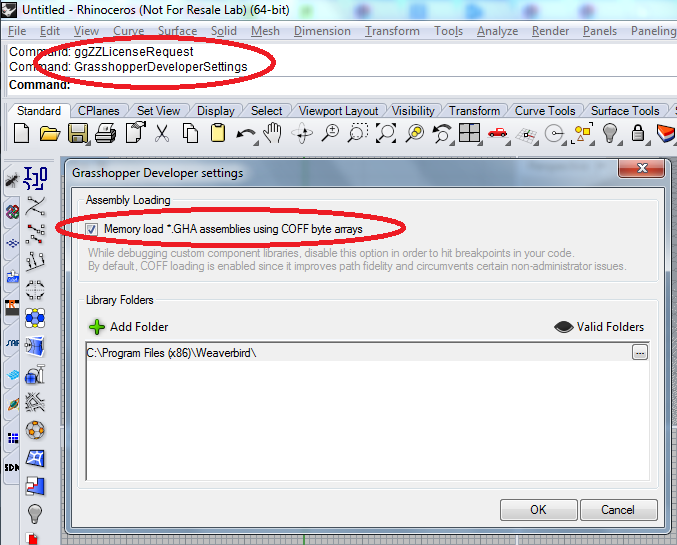 If these haven’t appeared (check for loading error reports as grasshopper starts), the most obvious solution is either update Grasshopper (if not running latest), or run Rhino command GrasshopperDeveloperSettings and tick COFF loading (previous versions commonly required COFF loading to be not checked, so try toggling if having problems).